Earlier this year, president of France Emmanuel Macron put out the call for projects for the first annual Paris Peace Forum, a global platform for analysis of governance projects. 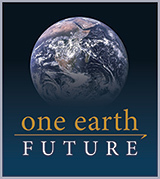 One Earth Future’s mission echoes the belief that sustainable peace comes from a global system of networks collaborating together, and One Earth Future is excited to participate in the inaugural Forum this November. The global diaspora makes a significant contribution to their families back home. The funds they send strengthen communities and can even rebuild countries that are emerging from war. Tuna play an important role in oceanic ecosystems. Unfortunately, the word's appetite for tuna means their populations are at risk from overfishing. The private sector has led the way toward supporting, creating, and implementing peace in areas where there is limited government capacity according to panelists at a One Earth Future (OEF) led workshop at the annual Build Peace Conference.